In addition to the industry standard semblance velocity analysis, TGS has developed a structural autopicking application. This application performs a dense automatic velocity analysis and picking using the initial functions, picked by humans, as guide functions. In either 2D or 3D the software selects the best velocity within a user-defined variance from the original guide functions. 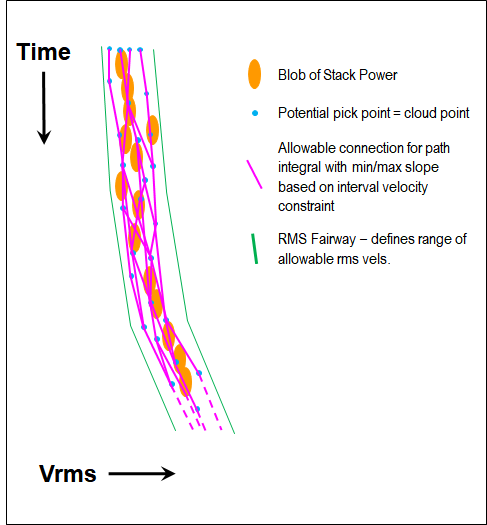 The output velocities are then smoothed in Vrms, Vint grids and also Time, Velocity (TV) pairs (vertically). An option to define the waterbottom time and velocity is also incorporated in the application. A dense grid of Vrms and Vint models of higher quality than decimated TV pair picks. This can be applied to large datasets, and it can manage a challenging geometry and/or surface (Land). The algorithm has also been enhanced to correctly update in the case of fast dip changes near the water bottom.